Mr McKenzie was my next door neighbour when i was a liitle girl he and his wife ran the sunday school in Stewarton on a sunday afternoon i remember him as wonderful man who had a passion for roses. His wife has sent photos into the courier( down memory lane) over the last few week. Great to see the photos of the stained glass from Lochend Church - it's a shame it was demolished but good to know that the windows are being preserved and enjoyed. Hmm, if this is the same Mr MacKenzie that chattichatton has mentioned being from Stewarton then he was a very interesting and very intelligent man. If I'm correct, this is Donald J MacKenzie Depute Assessor of Argyll County Council who interviewed me for a "temporary" job in June 1970 as a measuring assistant in the Assessor's Dept. and based in the ruin beside the heritage centre on the Big Kiln. 38 years on I'm still there and so is the ruin! I met Donald J in his office on the first floor of what is now the Finance office in Witchburn Road and could barely see him through a cloud of smoke and completed the interview with success and smelling like a kipper. As an office junior, for 3 years I was his fag runner down to Daniels' shop, no Vicki Wine in those days, for 60 Bristol, another memory, that I had to pay for out my own pocket before recovery from Donald, if you could find him through the fug. The boss at the time, James C Wilson who lived at Balegreggan House, refused to set foot in that office, a luxury never afforded to the proletariat. A year before Strathclyde took over and Donald was pensioned off, it was decided to re-decorate the office and it took Cochrane's painters a week to fumigate and strip the room Office legend had it that he did not smoke at home and God knows how he would have survived with today's workplace rules. The old weigh house is still standing and so is the Rex. Anyone know the missing word on the 1st building on the right ....Highland E...........? Could the "E" be part of the word "Highlander", rather than the beginning of another word? Maybe a pub name like "Highlander's rest", or something like that? Just a guess, I could be wrong. It's been known. Love this thread, I've seen pictures of places I'd forgotten I remember, if you know what I mean. Oorly it is indeed the same person I never knew he smoked so the legend must have been true, he died the the early 1990's if i remember right but he passed on his love of roses to my dad and me. I recenly had the opportunity of being at a party in Stewarton village hall and i was amazed how much it has changed internally since i was a little girl. I believe that the oldest part of the building was once a house, but know little else about it. I think you may have hit the nail on the head Hugh. The earliest memories I have it was as "The Kinloch",which to my mind was the best bar in town. Just remembered it used to be 9pm closing time. Different days. The ice cream van you would remember was owned by Tommy Galbraith, who later went on to open the original Chocolate Box in Longrow. 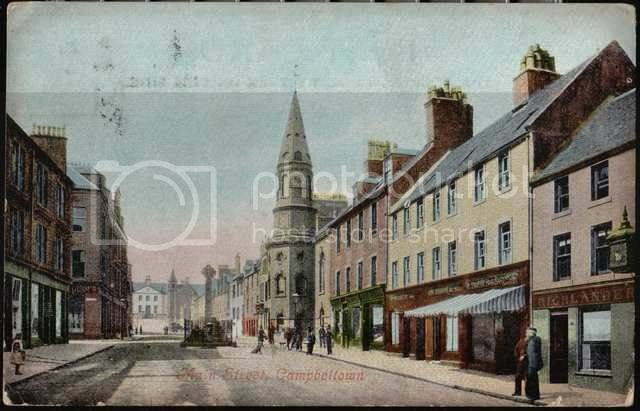 The two bottom buildings on the right were knocked down to make way for the continuation of buildings up into Main Street during the opening up of Longrow South. The bottom one was where the road now turns up into Longrow. The infamous Wide Close would be behind the block nearer the Town Hall then? It would appear that these two blocks, together with the Wide Close and much of Union Street were demolished in 1908 and Longrow South was completed in 1910. Dumped fishes bones and other swills. Cast shame upon the human race. There doesn't appear to be any other old photos on any of the sites that clarify the name on the building. Wot no boy racers ? Could it possibly be "Highland Emporium"? You don't know how fast the cart is going! Good research, Gizmo for another clue to the name of that establishment. Looks like "Highland Emporium" is not the name. "Highlander's Rest" is still in the picture. Is "Highlander Bar" a reasonable guess, given Campbeltown's history of whisky distilling and consumption? Maybe all will be revealed, one letter at a time. As forum members trawl through their old photos. It's a long shot, and we're talking about 100 years ago but does anybody know any of the more "senior" citizens who may know of anecdotal information of the name of this place? It's become a bit of a tantalising question for me! What about " Highlanders Institute ". Some sort of fisherman's, lodging house. Is that a clock - or a lamp above - the R in HIGHLANDER ?. I notice no clock face - on the old town hall steeple. Is that two dogs on the road ? - perhaps responsible owners kept the dogs off the pavements !. That seems a fairly high fence around the cross - is that someone sitting on a bench at the cross ?. The picture seems to have been taken on a hot summers day - judging by the open windows. The black and white photograph gives more detail. Only one dog on the road - and one wee lassie. That looks like a lamp above the E - a sign of welcome perhaps?. Their is a clock face on the steeple. 27 minutes past 11AM. The shadow casts - seem to suggest late morning. I wonder - if the man talking to the other man - has just asked for money ?.